Welcome to what is, to all intents and purposes, a small thank you note to The Moody Blues, for so many years of wonderful listening pleasure. We've travelled with you on so many voyages, through so many landscapes, and always, we wait for the next journey to begin. The beginnings for The Moodies, and for Sam had the same starting point, the same city in central England, so it seemed fitting, on that level, as well, that this site come to fruition. Let's begin this small journey with a brief biographical over-view, and go from there. Lovely to see you again. 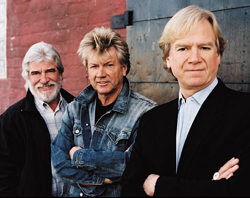 Clint Warwick (bass/vocals) and Graeme Edge (drums) came together as the R & B Preachers, which in turn became the first incarnation of The Moody Blues, They were all accomplished musicians with much experience in local bands. The group gained a national reputation as a tight rock/R&B group, signed to Decca Records and released their debut single, "Lose Your Money," all within six months of forming. By early 1965 their second single, "Go Now," was at No. 1 in the U.K. and No. 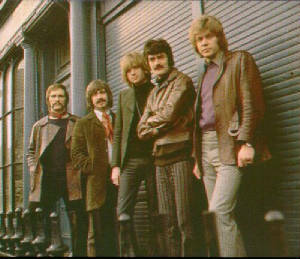 10 in the U.S. After touring Britain with Chuck Berry, the Moody Blues traveled to the United States supporting The Kinks. 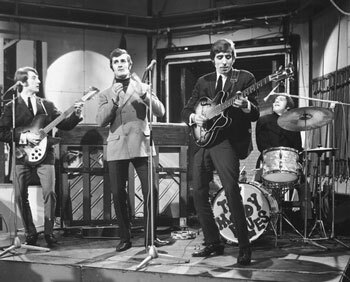 Unfortunately their 1965 full-length debut, The Magnificent Moodies failed to chart, despite the promising success of their early singles, leaving the group dejected. Months later Clint Warwick retired from music, and by October 1966 the band broke up, exhausted from touring. Laine went on to a solo career, later working with Paul McCartney; the rest of the band regrouped a month later with guitarist Justin Hayward and bassist John Lodge filling in for Laine and Warwick. In 1967 the new Moody Blues scored a big hit with Days of Future Passed, a concept album which combined classical orchestration with rock music, an innovative move which won the band instant praise. Thanks to the singles "Nights in White Satin" and "Tuesday Afternoon" the record went gold, reaching No. 3 in the charts. Their 1968 follow-up, In Search of the Lost Chord was equally successful, pioneering the use of the mellontron in pop music, a synth-like instrument which became a key part of their sound. On the Threshold of a Dream and To Our Children's Children's Children, both released in 1969, continued their string of gold records with overdubbed, psychedelic rock soundscapes. With 1970's A Question of Balance the group elected to use fewer studio effects so as to enable the band to perform their songs live without special arrangement. The new, more stripped-down sound was even more popular with fans, and the album went to No. 1 in Britain and No. 3 in America. Every Good Boy Deserves Favour, a 1972 album named after a music theory mnemonic, and 1973's Seventh Sojourn were even more popular, reaching No. 1 in the U.S. and U.K.
After an epic nine-month world tour in 1974, the exhausted Moody Blues announced they were going on hiatus for an unspecified period. All five members released solo albums, and in 1978 the group decided to resume working together, releasing Octave, their first platinum record. Pinder was replaced with Patrick Moraz, and the band embarked on another world tour. The group continued releasing albums throughout the '80s, becoming a popular oldies band. In 1992 Moody Blues performed at a landmark concert at Red Rocks accompanied by a live symphony orchestra; an album and video for A Night at Red Rocks was released the following year. An improved, remastered "greatest hits" compilation, The Best of the Moody Blues, was released in 1997. Tell me what you sing. Of voices in the sky? Of voices in the sky. Just what is happening to me? The bell's about to ring.